SCVHistory.com LW3161 | Brand-New California Aqueduct Ruptures, 10-12-1971. Incident October 12, 1971 | News Reports. 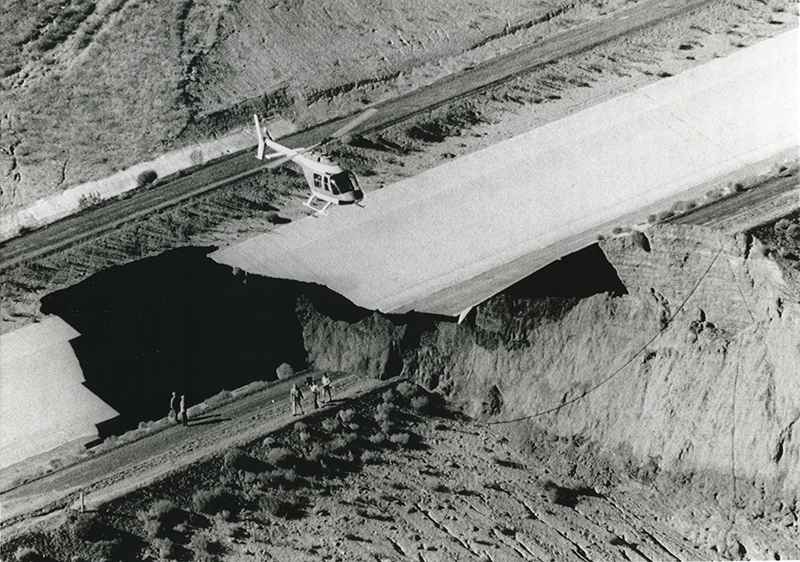 October 13, 1971 — A helicopter hovers over a section of the California Aqueduct that failed the night before in Lancaster, five days after water first started flowing through it. It's the same system that provides drinking water to the Santa Clarita Valley. HCP101302 — 10/13/71 — LANCASTER, CALIF.: A helicopter flies over the massive break in the newly dedicated $2 billion California Aqueduct. Several square miles west of here were inundated, but damage was minimal, when the aqueduct let loose late 10/12. Waters Rush Over Farms and Desert in Antelope Valley. By Ray Hebert, Times Staff Writer. Los Angeles Times | Wednesday, October 13, 1971. Sheriff's deputies ruled out sabotage today after a preliminary investigation showed no evidence of an explosion in a ruptured section of California's new aqueduct system. Twelve hours after the sudden break occurred, sending millions of gallons of water pouring over Antelope Valley desert and fanning land, deputies said they could find no evidence of tampering with the multimillion-dollar facility. State Department of Water Resources officials immediately began their own investigation of the mishap, which sent water rushing through a 90-foot break in the aqueduct 13 miles west of Lancaster late Tuesday night. The rupture posed no threat to residents of the sparsely populated Antelope Valley area, but flood waters entered a ranch home and damaged alfalfa fields west of Lancaster, according to reports. After the break, a 5-mile section of the canal was automatically closed off. Concrete and steel gates at either end of the section isolated the rupture and kept other water from streaming out. In Los Angeles for a speaking engagement, William R. Gianelli, state water resources director, played down the significance of the mishap. He said the rupture, which occurred about 40 miles north of downtown Los Angeles, was being "played out of proportion." "Actually 230 acre-feet of water went out of the aqueduct, but there was no appreciable damage as far as can be determined," he said. "Our fellows are checking." An acre-foot is equivalent to about 325,000 gallons of water. The rupture appeared in a section of the 4-inch-thick canal walls in foothills at the west end of the Antelope Valley. It severed the 60-foot-wide canal and wore a huge channel in foothills below the aqueduct. Water rushing down a slight incline flowed toward Lancaster, fanning out over an area a mile wide and 8 miles long. Water in the aqueduct was nearly 2 feet deep as it poured out of the rupture hut leveled out to about 10 inches as it sent mud pouring over Aves. J, K and I and 110th St. West. Sheriff's deputies closed the lightly used country roads for several hours while work crews cleared away the debris. The break occurred on a section of the West Branch of the California Aqueduct, a man-made river built to transport water from the Feather River to Central and Southern California. Only last Thursday Northern California water began filling the West Branch after it was pumped for the first time over the Tehachapi Mountains, a topographic barrier between Central and Southern California. Stale officials said about 15 feet of "still" water was in the aqueduct at the time the break occurred. The water spilled out, carrying huge blocks of the canal's concrete lining with it. The aqueduct's broken portion — part of the state's 444-mile-long aqueduct system — was carrying water pumped from the huge A.D. Edmonston Pumping Plant south of Bakersficld. Gov. Reagan dedicated the plant last Thursday. In the next four days nearly 1 billion gallons of water was pushed over the mountains, filling a 36-mile section of the aqueduct's West Branch. Los Angeles Times map. Click to enlarge.